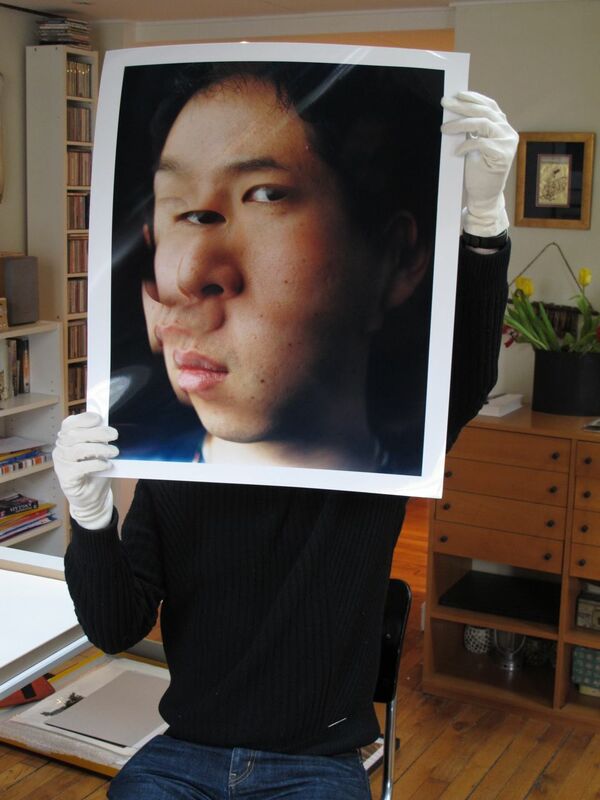 Photograph taken by Michael Wolf of Marc holding a print by Bishin Jumonji. Marc Feustel is the brain behind eyecurious, the photo blog that “travels to as many photographic territories as possible”, with categories ranging from the ever popular American Photography to my favourite: Existentialist photo-ramblings. Marc’s first love is Japanese photography and he knows a fair bit about photo books too. He’s been blogging since 2009 which has opened up opportunities further afield like interviewing for FOAM or reviewing for lensculture. In and of itself though, eyecurious gives a critique of photography events, images and people in an informed yet friendly manner. Marc is passionate about increasing access to the visual arts between cultures, particularly between Asia and the West. As a means for doing so, he is one of the directors of studioequis who are flying the flag for Japanese photographers outside of Japan. It has become a go-to place for people wanting the low down on Japanese imagery, something hard to come by in English. Marc is based in Paris, where I met him the other weekend at nofound photofair. After a nice chat he agreed to let me pick his brains about social media and it’s impact (or not) on the life of a photographer today. SB: Blogging is on the decline? How come, too many cooks? MF: I think there are a few different things going on. Firstly, social networking has taken over from blogging in a significant way. A lot of the online activity relating to photography these days takes place on Facebook, Twitter and Tumblr. There is actually an increase in online activity on photography… unfortunately my feeling is that this shift to social networks has led to a decrease in the quality of the conversation. Most of what gets posted on Facebook or Twitter is promotion or self-promotion. Also those platforms cater towards very brief exchanges like posting links or making a comment, not really to going into depth on a given subject. Our online attention spans have got shorter and this does not work in blogging’s favour. People spend less time reading lengthy blog posts. However, I think this also means that those that weren’t really paying attention anyway have started hanging out elsewhere and blogs are left with their core audience of people that are actually listening. A lot of established bloggers (bearing in mind that being an established blogger means having been around for a year or two) have also shifted from a blog format to a magazine format. The problem with blogging is that as soon as you have got a certain amount of content, the fact that it is displayed all in one long blogroll means that anything that is more than a few days old ends up hidden away in the basement. What impact do you think blogging and online mags have had on the exposure of new talent? I think there is no question that blogs and online mags have given emerging talent a much larger audience. The maths is pretty simple: on average photobooks get published in an edition of 1,000 copies, whereas getting your photographs published by a decent online mag or blog will get more viewers than that in a single week. It has become an important way to get work ‘out there’, particularly given how few print photography magazines are still relevant today. How does this translate into the real world of galleries and publications? To state the obvious this means that the playing field just got much bigger so now any photographer with a website can hope to grab the attention of galleries, curators, publishers, editors, etc. from all over the world. However, most of these people don’t have enough time (and even less inclination) to scour the net looking for the next William Eggleston. There is a small chance that a few of them might actually read an online mag or check out a blog from time to time and come across something that interests them. When it comes to being picked up by a gallery that is a decision that is generally based on many other things than how good a photographer’s work is; such as whether their work is ‘sellable’, who has recommended them, what their track record is, etc. Publishing is a different matter. This is a particularly exciting time for independent and self-publishing and there is no lack of publishers to approach with book ideas. In both cases however, it is highly unlikely that a publisher or a gallery owner will track down a photographer just because their work has been blogged about or appeared in an online mag. Having a good online presence is more like a first step in the right direction. How real is the online photographic community and how does it compare to actually meeting people in a professional capacity? How real are your Facebook friends and how do they compare to your real ones? The real advantage about having an online social network is that it can lead you to meeting people in the real world that you might not have otherwise. A way of removing degrees of separation between people. How have you seen blogging used best? There is no single recipe for a good photoblog so here are a few examples that spring to mind. DLK Collection who posts relentlessly, reviewing pretty much every photography exhibition on in New York and giving a collector’s perspective on photography, which is very hard to come by. John Sypal’s Tokyo Camera Style is a blog solely about the cameras that he sees people carrying around Tokyo (it has spawned dozens of other Camera Style websites in cities all around the world). It is fascinating, even though I have no interest in camera equipment, because it shows this crazy idiosyncratic relationship that people have with photography. One particularly innovative use of a blog is underway right now: Pete Brook has taken his excellent Prison Photography blog on the road, using the blog to raise funding to tour the US to interview people involved in a very specific, overlooked field of photography. And then thankfully there is Blake Andrews who always manages to look at the photo world from an unexpected, generally hilarious angle and avoids taking anything seriously. The blogs that work for me are those that have a singular voice; that are saying something that cannot be heard elsewhere. What advice would you give photographers blogging about their own work? Think about those photographers that you admire and how they present their work online. I personally hate self-promotion so I would advise you to not do any of it, although this will probably lead you to remain totally unnoticed, so I would say think long and hard about how to self-promote in an intelligent way. Don’t feel like you need to post every day, post if you have something to say. Don’t be afraid of criticising, of having an opinion. Don’t just say that you like or dislike something, explain why. I think a photographer’s blog should reveal their considerations, their inspirations, their process (but not technical detail). What really draws people into a photographer’s blog is the feeling that they are getting a behind-the-scenes look into someone’s world.